Hello from Utah! It seems that we’ve got light rail fever (even me)! Just this month the Frontrunner (our new commuter rail line) opened, and everybody turned out to see it. So, in honor of the State of Utah’s new achievement, I have designed a plan for passenger car switching, set in an urban environment. It could work for any locale or railroad, even an Amtrak station. The specific locale of the trackplan as I intend it is the Frontrunner Salt Lake City station, with a city skyline (and the mountains — you can’t forget the Wasatch Front!) 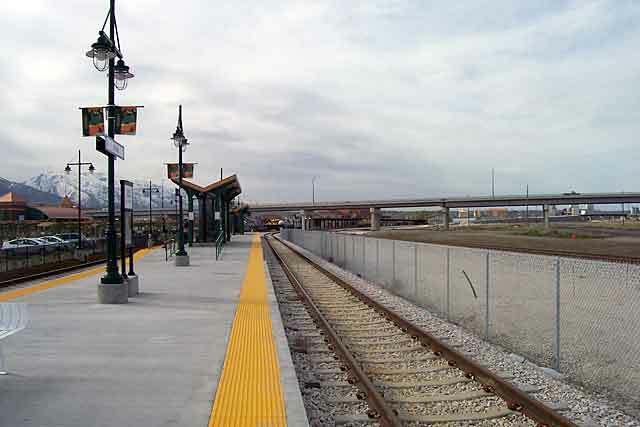 in the background and a low-relief station platform (check out the attached photo). Rolling stock would include two Bombardier cars (a coach and cab car) and one RTA four-window coach, and a Trackmobile. The Bombardier cars from Athearn Trains would look great, and Kato’s RTA coach would do nicely. The idea would be to arrange the three cars so that the RTA coach is in the middle and the cab car facing the trackmobile on the longest switching lead (in the lower left corner). As you can see, a transfer table would simplify switching, especially with a combination of cars that could make things interesting. It is optional, however, for those adventurous operators.